Once an order is scheduled, our Machine Shop will receive drawings and dockets from our CAD designers in the office. From these they can begin cutting and pre-drilling the lengths of timber that are required for each structure, ready for the Joinery to assemble. 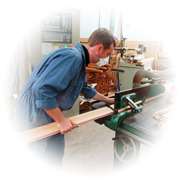 Quality control procedures are followed at this point to ensure a minimum knot content within the timber. Our joiners are responsible for the pre assembly of our structure panels. 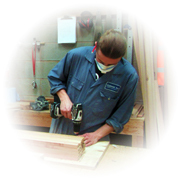 Once the machine shop has finished cutting the timber to length, the joinery will cut the apex of the timber, then, using the pre-drilled holes, assemble the structures in full panel sides ready to be taken up to the warehouse and packed for shipping. Our quality control manager will do a final check of our structures, to ensure there are no defects. 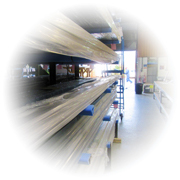 Most of our aluminium arrives with us already powder coated, with the exception of certain bespoke pieces which are sent off to be specially treated. Our aluminium shop then cuts and pre-drills the metal ready to be affixed to the structure by our joinery. Parts such as the guttering and full ridge ventilation systems are sent to the warehouse to be joined with the structures once completed. 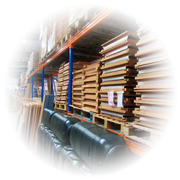 Once our structures have passed their final quality check, each order is moved up to the warehouse where it is stored until collection day. From then, the structures are arranged in their delivery order, and the glass is packed into separate glass crates, where it can all be loaded onto our delivery vehicles, and transported either to their domestic, or international home ready for installation.